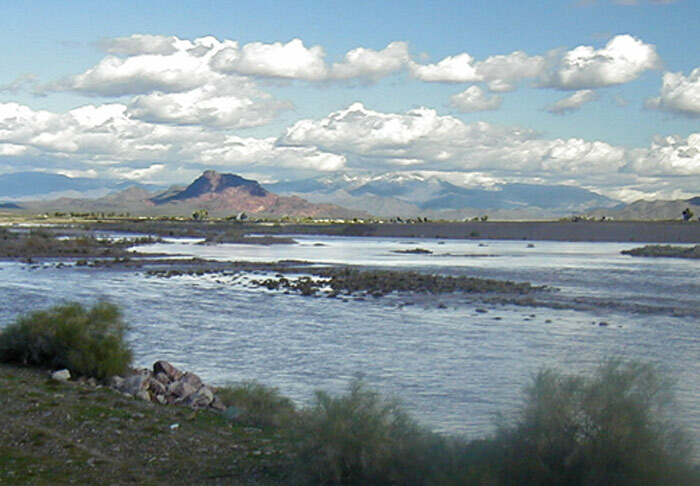 After visiting the Indian ruin at Mesa Grande, Bartlett’s party found a shady spot on the river a couple of miles north of the ruin where they could wait out the intense Arizona heat of the July afternoon under the cottonwood trees. While at this camp Bartlett sketched the view upriver where his guide pointed out an important landmark. The prominent peak with a knob on top is called “Red Mountain” today. 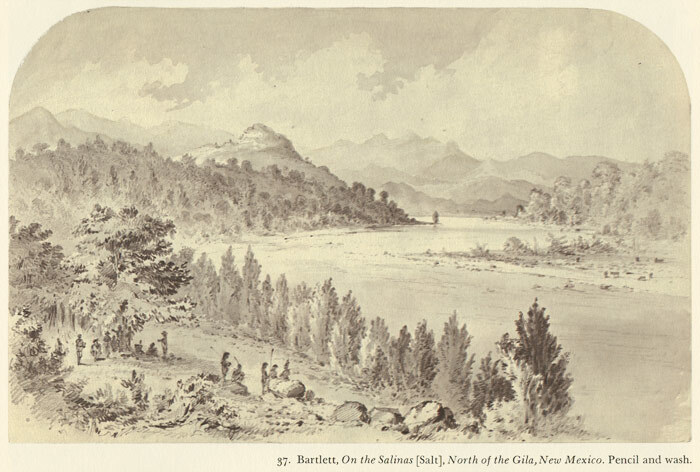 Lithograph of Barlett’s sketch “On the Salinas, North of the Gila, New Mexico.” From Bartlett’s West, by Robert V. Hine. Used by permission. Salt River, Red Mountain and Four Peaks, Mesa, AZ. Tom Jonas photo. The photo above was taken from the north bank of the Salt River just east of the Country Club Drive bridge in Mesa, Arizona. The prominent peak left of center is Red Mountain. Four Peaks is visible to its right. The Verde River joins the Salt River at the base of Red Mountain. Thanks to the flood control dams and modern development, the cottonwood and willow trees are mostly gone today except in a few places where there is permanent water. 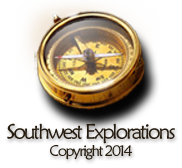 July 4th, 1852…As it was now growing very warm, we left the plateau and struck off for the Salinas, encamping beneath some tall cotton-woods, where we prepared and partook of a late breakfast. Mr. Leroux, who had before come down the Salinas, pointed out to me a mountain some six or eight miles off, at the base of which the river San Francisco or Verde enters from the north.